Christmas Ornaments Made in USA - 2004 U.S. Capitol Marble & Wood Ornament - A Christmas Ornament Co. 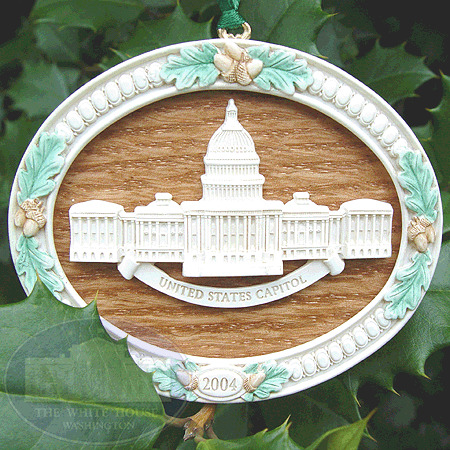 The A Christmas Ornament Collection presents The 2004 Capitol Marble & Wood Ornament. This unique collectible is made of the historic building materials that have adorned the Capitol and its grounds. The marble that creates the oval frame and center Capitol was removed during the renovations of the East Front of the Capitol. The marble is crushed into a fine powder; resin is added to hold the fine particles together and molded into the classic shapes. The wood has been sliced from the trees that were once part of the Capitol grounds. Many were planted by people or organizations that memorialized Members of Congress, individuals, groups, or events that contributed to the shaping of our nation.